The Leica RM 2145 Rotary Microtome was designed to meet the needs of pathologist throughout the globe. The easy to use microtome works well with paraffin specimens and comes complete with blade holder. The feature and parts of rotary microtome include three trimming increment and two system drive wheel lock. The Leica Microtome includes a revised step motor with micrometer feed for precision thickness selected by the user. This feature delivers reproducible section thickness and consistent section quality of specimens. The Leica RM2145 microtome includes a programmable specimen retraction feature along with a section count used for high throughput precision sectioning. In addition, this rotary microtome comes with a quick release clamping system allowing the user to run the instrument with one hand. Microtome also includes a sample auto feed stop with built-in alarm to safeguard the user. Contact us today to learn more about our Leica RM 2145 Rotary Microtome. 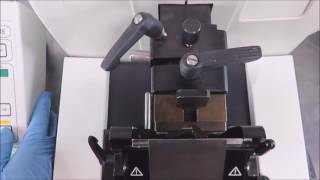 The Leica RM2145 microtome has been tested by our technician and is in excellent working condition. We purchased a blade holder along with an arm rest for this instrument and it's currently ready to ship. Due to the size and weight of the machine, microtome will ship out via freight with a 1-3 business day turnaround time. If you would like to receive a price quotation please fill out the form below. If you have any used lab equipment you wish to sell please give us a call. We buy used laboratory instruments from all over and offer several solutions to manage your lab assets.